This is an impressive dish that really only takes 10 minutes of your precious time to put together. But – there are 3 things you have to get right in this recipe to earn the title of “impressive”. Perfectly fried egg, sunny-side up with still-runny yolk…. 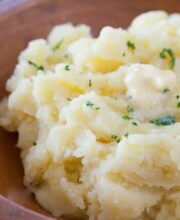 This is a great recipe as a side dish for dinner or brunch even. 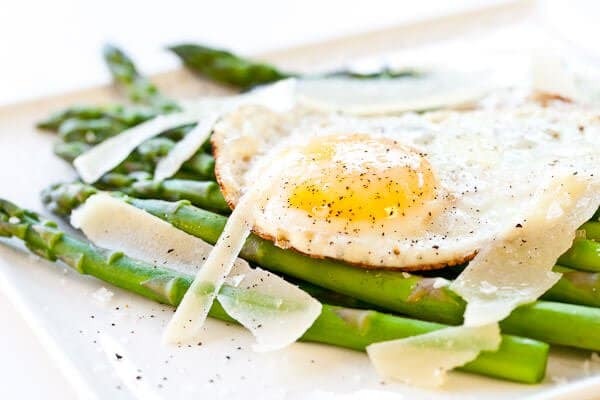 If you cook your egg just right, when you break into the egg, the golden yolk pours out and slowly coats the asparagus spears. See how milky translucent the center of the bottom is? It should not be dried or hollow. 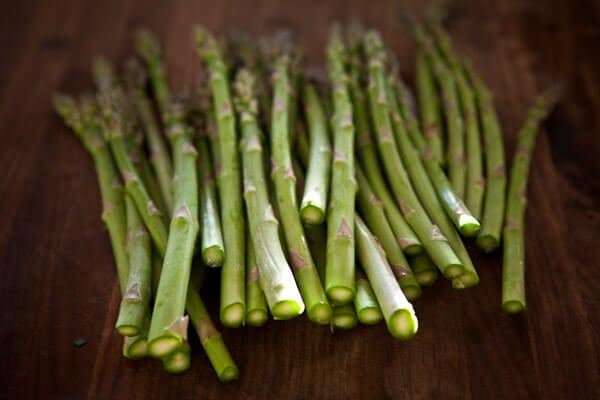 The tips of the asparagus should be tight, firm and closed, like a brand new artist’s paint brush. If the tips look all frayed like a 3-year old tried to paint the floor with them (ahem, lady with the undisciplined boy at the grocery store this morning)…. well….then I advise you to pass. 1. In large frying pan, bring 1 inch of water with a large pinch of salt to boil. Lay asparagus in pan, cover with lid and cook for 2-4 minutes (depending on thickness of spears) on medium heat until just tender. Drain and plate asparagus on serving plate. 2. Wipe frying pan clean. Heat the olive oil over medium heat . When hot, add egg(s) to pan and fry 2 minutes. Turn heat to low, cover pan and cook an additional 1-2 minutes until egg whites cooked through. 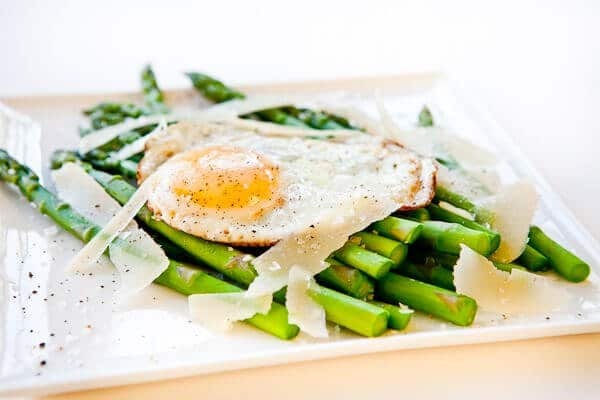 Slide eggs on top of asparagus. 3. Season with salt and pepper. 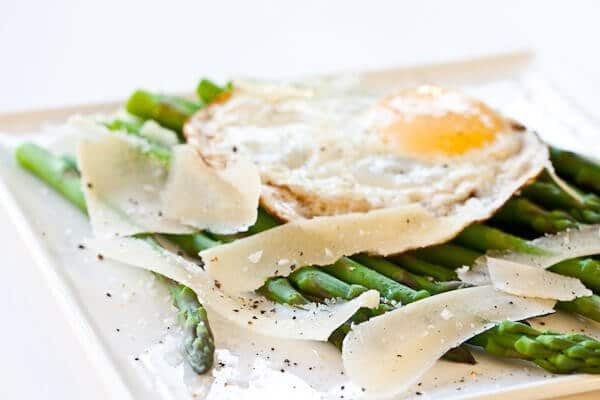 Shave Parmesan cheese on top with vegetable peeler. Yum! I’m going to make this next time I pick up good asparagus. I could also see topping everything with some bread crumbs (or serving it on toast as I often do). 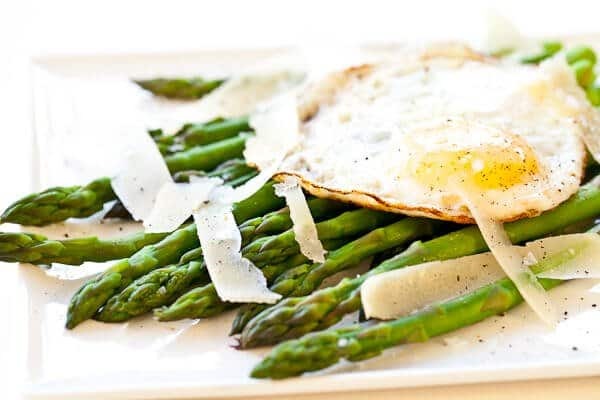 I’ve never thought of adding a fried egg to asparagus. This sounds amazing. So then it’s cool if I used canned asparagus right? wow those pictures sure make the recipe look even tastier. as a person who loves to cook and bake in my kitchen at home, I would simply offer a friendly recommendation. 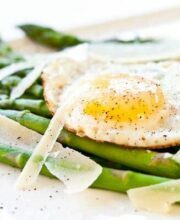 When using egg-based recipes, maybe try pasteurized shelled eggs. Especially when you have sunny-side eggs, (fried eggs,) raw cookie dough, anything to that affect which leaves some part of the egg raw. Only reason I say this is because I am concerned with what I eat,and also look at those who I’m cooking for. With all these recent egg recalls, you can never be to sure. You should check them out. Sometimes the simplest things are the best! This is definitely a much-loved combination! And I so agree about the runny yolk-crispy edge egg perfection! What a gorgeous and colorful dish! And all the better because of how quick it would be to throw together. 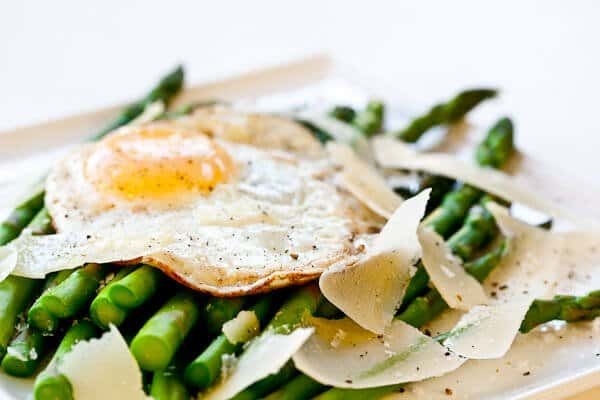 What a delicious dish, fried egg with asparagus, i can imagine this would also be great with some parma ham and maybe a slight touch of truffles. Great photos and descriptions as always! I loved the part of the little boy using the asparagus as a paint brush on the grocery floor. Yum! I love simple recipes like this. I have all these ingredients, and will try this tonight! This looks so good!! I love asparagus!! 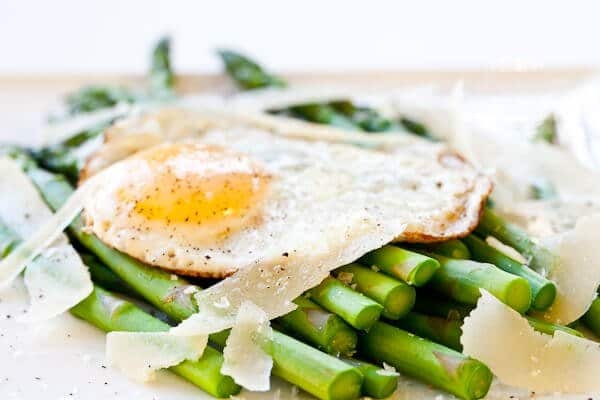 I am imagining the yolk running over the asparagus. Love it! 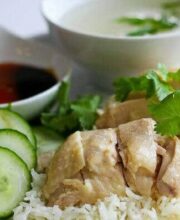 This could be breakfast,lunch or dinner! Do you use a lightbox to take your photos? This looks lovely! I can’t wait until springtime. We always have so much asparagus and never quite enough ideas (though I love asparagus so much I could eat it plain w/ butter until forever). thanks for the ideas! I LOVE this combination!! I usually do a poached egg, but fried sounds even better to me. Yum. @Hannah, you’d have an egg for each serving, in my opinion, so that the eater can break the runny yolk over the spears and dig in. Yes! This is my kind of dinner. I am a sucker for evening eggs — maybe it’s the Spaniard in me. This looks really amazing. I think I just might have to make it for meatless Monday next week. I hope I can get my hands on some good looking asparagus! 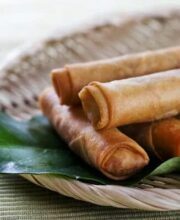 Thanks for sharing something so simple and fresh! This looks tasty- three ingredients I really like. But I’m not sure what the right way to eat or serve this is! This looks amazing – I need to try it tonight!